Cook marks his return to form with a dogged 95, while Ballance hits his 2nd successive ton to put Eng on top. Two sets of anxious eyes looked helplessly at Ravindra Jadeja at third slip. Pankaj Singh had bowled a bonafide wicket-taking away-going ball, Alastair Cook had played a wicket-giving prod. Now all Jadeja had to do was to hold on to the knee-high catch to ensure that 11 men on the field would celebrate and 57 million on this Island would go into mourning.By spilling the catch, Jadeja saved England’s Sunday, maybe even Cook captaincy. Tragically, it denied Pankaj, the best pacer of the day, a dream Test debut. Cook was on 15, the game was just 10 overs old. In the final session of the day, Cook, on 95 now, would play another false stroke and once again two sets of anxious eyes would helplessly look at umpire Marais Erasmus. Trying to force a shortish Jadeja ball off his legs, he had edged the ball to MS Dhoni behind the stumps. 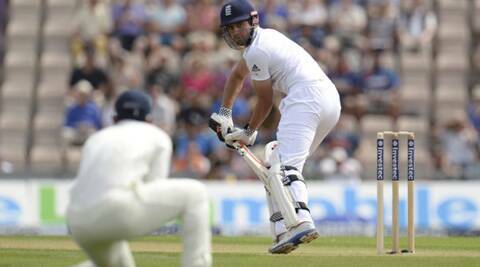 Jadeja pleaded, Cook gave a blank look towards the man wearing white and black at the non-striker’s end. Erasmus, thought for a while, rather unusually hitched up his pants and raised his finger. Cook would have liked 5 more runs but the 95 he scored were precious. It got him a standing ovation from the capacity crowd and made his harshest critics change their opinion, for now. The innings gave England a head start in this Test and blew away the cloud of uncertainty that had loomed over the home dressing room for some time now. The sight of a relieved captain with his feet up clapping after Gary balance reached his third Test hundred, proved how one innings of character has the power to change the course of a career, tempo of a team and, perhaps, the narrative of a series. With England finishing the day at 247/2, the home team had come back strongly after the defeat in the second Test at the start of this week. On a pitch that wasn’t really cut from the same cloth as the one at Lord’s, more runs, from many more batsmen, can be expected in the coming days. England seemed to have realised that a prominently green pitch was more suited to the visitors. An inexperienced batting line-up, an out-of-form captain can’t be made to cohabit on a lively track with smart seamers from the rival camp. There are a couple of theories floating around at the Rose Bowl. One school of thought says that the pitch would get faster later in the game; the more depressing prediction was about how this Test could be reduced to a run-marathon. In case the batsmen do dominate play at the Rose Bowl, things could drag like they did today. With limited purchase for bowlers and balls coming slow off the pitch, Dhoni opted for defensive lines. Had it not been for the emotional connect that the crowd had with the England captain or the tension of watching a man on a tightrope, the less-than-three-runs-per-over day would have been tough to bear. Cook happens to be that rare left-hander who isn’t graceful. And once he becomes cautious and guarded, he doesn’t come across as a batsman you would travel miles to watch. He is a Jim Courier in an era that has cricket’s equivalent of Pete Sampras and Andre Agassi. Cook happens to be an immensely likable grinder who has scored tons of ugly runs. But for a while now he had stopped doing even that. He hasn’t scored a hundred since May 2013, and today he broke his 11 innings half-century drought. Some wanted him to quit captaincy while others asked him to go back to county cricket. On match eve, he was asked about Kevin Pietersen, no friend of Team England’s, joining the ‘Quit Cook’ bandwagon. “For the last three or four weeks, everyone’s been saying that. It is no different who else says it.” Cook wasn’t losing temper, patience or, as he showed today, his way on the road to redemption. That early Jadeja reprieve was the luck he needed. His game was much tighter today. He didn’t hang the bat out much often. When the ball would hit his bat, he eyes would be exactly over the impact. His early runs were around the square. There were no extravagant cover drive, even the shots hits down the ground were mere pushes. Cook didn’t want to lose his wicket today. With the tight off-stump line not working, Dhoni tried the ‘short ball’. It was a wasted tactic. Firstly, Ishant Sharma, the pacer who hits the deck, was not in the squad because of injury; secondly, Mohammed Shami wasn’t good at pitching the ball short. Besides, Cook, the master of the cut shot and the pull, wasn’t going to be perturbed by the balls that rose. What could have been a miserable outing, with the scoreboard at stumps reading ‘Cook c Jadeja b Singh 15’, had turned into a memorable day. Cook went past Pietersen and David Gower to be the third highest Test run-getter for England. Sadly, for Ballance, his flawless 104 got sidelined by his skipper’s 95. While they gave Ballance a standing ovation when he reached his hundred, the Sunday crowd left the Rose Bowl talking about Cook. Never has Cook’s ugly runs looked so beautiful to the anxious English eyes.